So, the topic of this month’s post comes to be because of half joking comment I made in passing to a friend a few weeks ago. 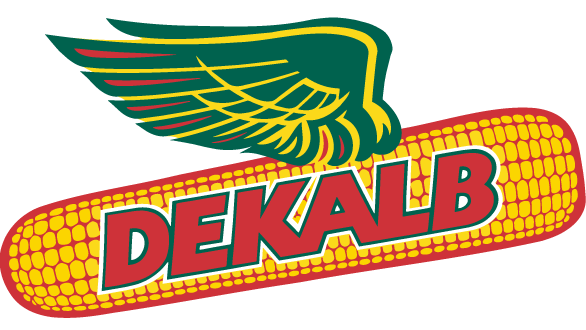 We had been discussing regional pronunciation, and I pointed out the best way to start a fight between an Atlantan, a New Yorker, and a Chicagoan was to bring up the word “Dekalb” and let them pronounce it. 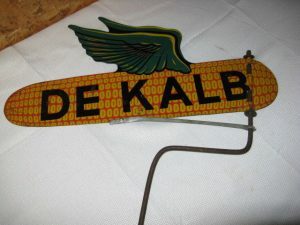 I grew up right on the border between Dekalb and Fulton counties here in Georgia, and so I had always heard the name said, as we do here in Atlanta, as “Dee-KAB”. However, my father, having spent many summers in Brooklyn as a kid, occasionally would say it as “Deh-KAhl-Lb ” when he first moved to Atlanta in the mid 1970s. 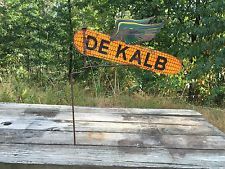 Yet apparently a third flavor of this word exists, with “Dee-KAH-lb” as the defacto pronunciation in the already phonetically challenging state of Illinois. 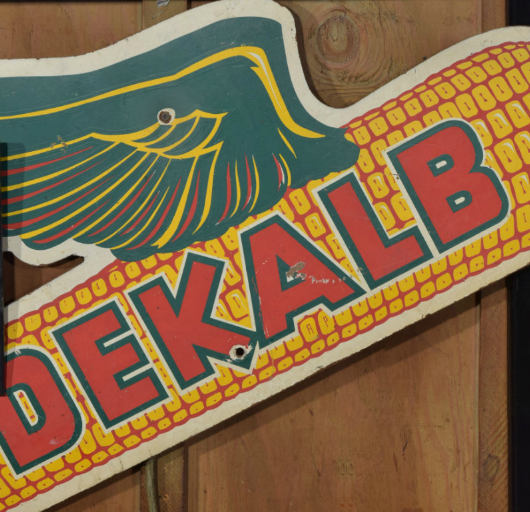 This round of phonemic insanity is brought full circle by a strange sight displayed proudly on one wall of Manuel’s Tavern, a stylized winged ear of corn bearing the word “DEKALB”. I remember having seen this particular sign nearly every time I have been inside Manuel’s over the years, and while I found it odd, I never really thought much about it. I assumed, quite incorrectly, that it was the logo of some local sports team with a silly mascot, or the icon of some equally silly but venerable institution out of neighborhood history. After all, I live in a city that has spawned the Seed and Feed Marching Abominable and the Briefcase Brigade, so a flying “DeCOB” of corn seemed to make just about as much sense as anything else around here. How wrong I was! 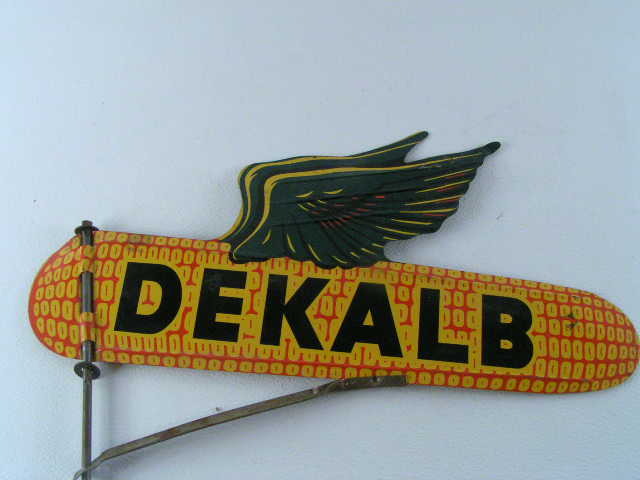 It turns out that this angel of the granary originates with the company now known as DeKalb Genetics Corporation (and owned by Monsanto), previously DeKalb Agricultural Association and DEKALB AgResearch, right out of that other hotbed of pronunciation oddity, Dekalb, Illinois. 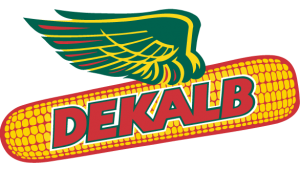 The logo originated when Tom Roberts, Sr. wanted a symbol to identify the new hybrid corn that DeKalb Ag was marketing in the mid 1930s. 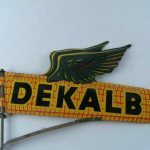 So, inspired by the winged Mobile Oil Horse (once a part of the Socony-Vacuum Oil Company, one of the resulting companies from the breakup of Standard Oil in 1911) which had just recently been introduced, Ken Kramer and a local sign artist came up with a winged ear of corn. The first signs were expensive, and printed onto metal sheets, then die-cut and given to farmers who grew the corn. Later, the logo was refined by graphics designer and printer Arlie Pearce, and then silk screened in three colors (green, yellow, and black) onto masonite sheets cut into the shape of the soaring seedpod. Eventually, a fourth color (red) was added, to make the logo pop even more. With thousands made over the decades, a vast collectors’ market in these signs has sprung up nearly from their first use, and the sign is even featured in the National Museum of American History. We can date this sign quite readily, by comparing it to a few other examples, including the museum specimen above. The Manuel’s flying corn is, unlike the NMoAH sign, a rightwards facing white outlined corn ear. There are four visible nail holes in the sign, and it bears a few obvious scratches and dings. The Manuel’s sign is also older than the NMoAH sign – instead of the DC it clearly shows AP, marking it as having been produced under Arlie Pierce himself, rather than by Display Craft who bought out the production in 1977. By comparison, this sign must be newer than the late 1940s, as it has the four color masonite silk screening, rather than the three color metal or masonite silk screening. As well, it is likely older than the mid 1950s, due to the design of the wings. The near identical nature to the 1977 sign likely means this was produced in the early to mid 1970s.